Today Mish interview Ally Saunders and present her artwork at dVerse. My choice was to write a few small poems on the theme of a bough. Pub opens at 9. PM CET. LOVE IT! Especially 4 and 5. You worked with the painting very well indeed. Wow, I love your poem. 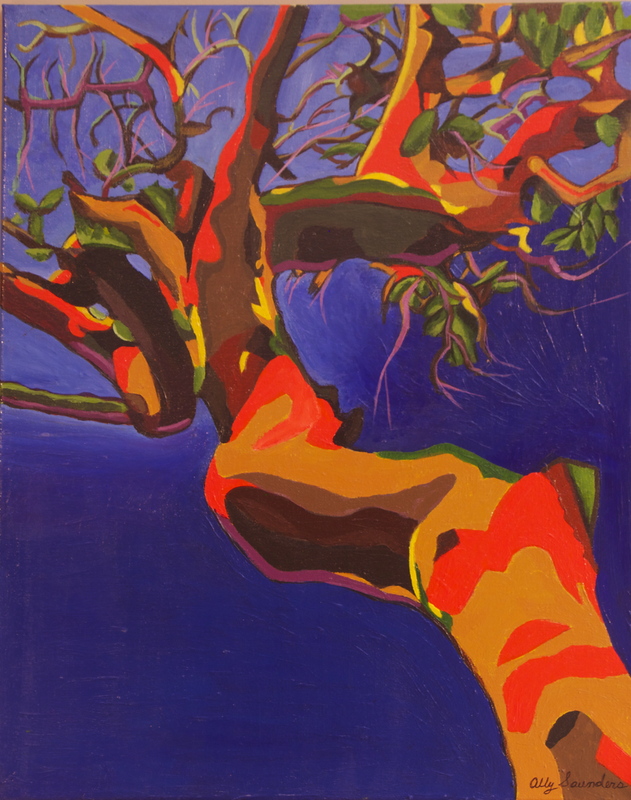 I never really thought of boughs as I painted the Arbutus. I saw reaching knarly arms. I could see that as well, and thought of is… but when I write to images I always try to write about something that seems less intended… that way the image and the poetry complement one another… I really loved this painting. ‘caterpillar contemplates the possibility to butterfly’ .. just love that Bjorn … great little cameos in these poems. All three of your best stanzas have been mentioned; nice creative way to approach the prompt. Is this a form, or just something you like to do? Number 6 s killer for sure. The poem sounds like the opening of spring and life to the world. The caterpillar, eagles nest, baby twigs; All opening to the hint of life. I am sure this form was done in MTB, but I can’t think of the name of it. I love the contrasts, the different views and voices. This is excellent. Well, just Wow! Love all of them but I think 5 is my favorite. ~Love the promise of hope in this piece, Bjorn! I like this very much. Back to cubism? Each stanza stands alone and then they work so well together. I love the painting, too. All those different dimensions linked – lovely. I love what you did with this prompt and I love Ally’s work—the possibility to butterfly! This is superb…. I love all the things this tree does and thinks. Oh, that last stanza is particularly wonderful. Love that “soldier’s arm,” too. Intriguing. I must say I am mesmerized…excellent…especially the last two …! bough – one of my favorite poetry words – it makes me think of billowing shushes. One cannot imagine how these standing trees can be the source of so much inspiration, but they do! The poem is outstanding. Thank you. It is wood and blood, and is thoughtful. Really good, Bjorn. Although it is not set out that way, this has the feel of a ghazal to me with the repetition of bough throughout. I so enjoyed each image. This is a wonderful series! I do think the last is my favorite; although, the idea of a bough dreaming of holding an eagle’s nest is nice too. I really liked these different perspectives of the same scene.